I purchased this product as a gift. The recipient loved it! The cut of the stones are designed in such a way that when light hits it, the reflected light makes it appear as though there are more stones than the bracelet has. Worth the money and the style! Bring fresh glamour and eye-catching style to your look with this lovely bracelet, available in your choice of silver overlay, or rose or yellow gold overlay. The striking bracelet features a delicate leaf link motif, silvertone pebbled detailing with a single white diamond accent adding a hint of shine to the bracelet. The vintage-style bracelet features a polish finish, and secures with a box clasp. I am wearing braclet(s) now as I write. They appear much better looking in person. I bought one with yellow gold overlay. Silver is cold looking on me. This gold was a nice warm rich gold. I enjoyed it so much that a few days later looked to see if the had "rose gold" available. They did! It came quickly, in a unique long red velvet envelope pouch, as did the first one. It looks great. I like to wear them together with one leaves pointed to left other to right. There is one thing that you may have to be aware of and that is sizing. I have small wrist, the rose gold was 71/4" and yellow gold was just shy of 7". With the exception of sizes, I have found this product to be an excellent value! 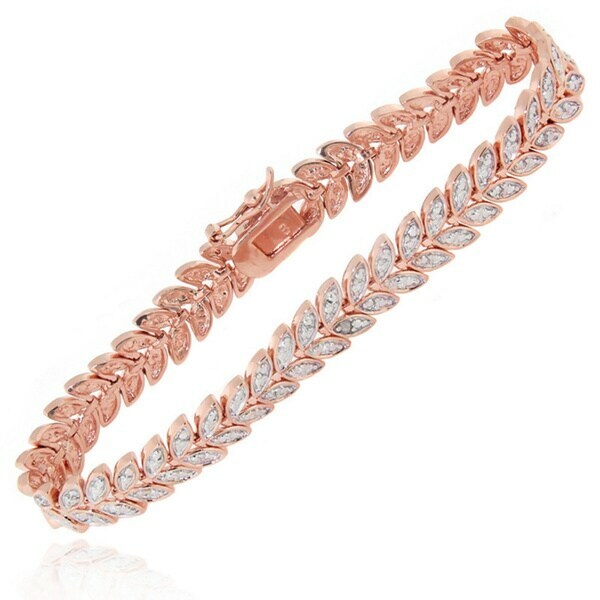 Bought the bracelet on rose gold, it is beautiful and elegant with a very secure clasp. May purchase it again in silver. I got this bracelet to go with ring & earrings seen at another online shopping venue. They match perfectly. Bracelet has small diamond accents, accurately depicted on website. Very nice bracelet, arrived within a reasonable length of time. leather pouch was a nice touch. Lots of "Bling" for the Money. Nicest One I Own! Nice gift, but this one I kept for myself! I loved the shine and glitter that this bracelet provides. It's the perfect choice for a special night out. I often wear many bracelets together on one arm - The affect is amazing. The clasp on this Accent Leaf Bracelet is secure, otherwise I would have returned it. I bought the gold overlay. I will keep in a gold protecting bag to keep it shining. I feel I got a very good deal on a bracelet that would have cost double anywhere else. Thanks Overstock! I love the way the bracelet lies on my wrist and has an expensive look and feel to it. Definitely a good buy! I love it! It is better than the pictures. This is so beautiful! This bracelet looks like it was far more expensive than it actually was! I will be so proud to present this as Christmas gift to my best friend. I's very sparkly, well made and true to the color of real 14K gold. Because of Overstock's prices, I can afford to give more lovely things to more lovely people! I call that a win win! Thank you! I've owned several bracelets like this and it does not look like the picture. Too expensive for what I was sent. I'm returning the day I received it. I bought this for myself and have enjoyed it very much. Love it . . . Love it . . . Love it . . . I received this bracelet today. I am simply thrilled with it. it is absolutely beautiful. The bracelet looks very delicate and feminine. It is very fluid and drapes the wrist beautifully. I would encourage anyone who is looking for a simply stunning bracelet to give this one a try. Absolutely love this Bracelet!!! I wear it all the time. I have a lot of people ask me about it and they never believe that I bought it in here. Just okay. Bought for my nieces ages 12 and 10. 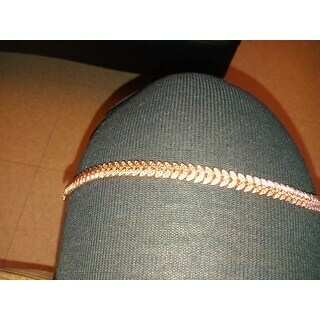 I love rhis bracelet wear daily. This is a beautiful bracelet. I love it! It goes well with most all outfits and it shines brilliantly. I get compliments when I wear it and enjoy wearing it often. I would recommend this bracelet form Overstock to others. The bracelet looks even better in person. It is a very lovely piece. "what is the length of the bracket"
8 in. I've bought 3 sizes: 6.75 and 7. "is this available? I've been trying to add to cart and it's not working "
Yes this item is available in different options. You have to select your option before it can be added to your cart. "This bracelet comes in a white envelope type of thing and it is the size of the bracelet when it is out straight. It does stay in there securely though"
The bracelet is 8' around. "Does this come in a box or just loose?" I bought this a while ago, but I believe it came in a nice velvety kind of bag. It came in a gift box. "is it amazing for my older sister. she's 16 and this might be her last gift form me and I need it to amazing"
This is really pretty. I think she will love it! Hi Just saw your question. I purchased 3 they are well made. I purchased two in the rose gold and one in the yellow gold. If I had it to do over, I would purchase all in the yellow gold. Very pretty and impressive. I got this bracelet to wear with my gown at my daughter's wedding. It is very pretty and your sister my enjoy wearing it when she wants to dress up a bit. I think every time she puts it on she will think of her baby sister and smile....it will be a special gift. "What does CAD mean please?" I think it's a jewelry design software. I enjoy wearing my bracelet: it's not too flashy and has a touch of class. I'm sorry I don't know. The bracelet is very nice though. "Hi, why the price gets higher?" I got mine while it was on sale. Check out the price today! How to Buy a Diamond Tennis Bracelet from Overstock.com. Be aware of these facts about diamonds as you shop for tennis bracelets.